Yesterday Apple finally approved the first substantial feature update to my favorite Twitter application for the iPhone – Twitterrific. The app had been sitting in the approval queue for quite a few weeks. The new version brings a flock of new features. I’ll go over my favorites here. The colossal list of all the changes can be found at Twitterrific’s version history page. 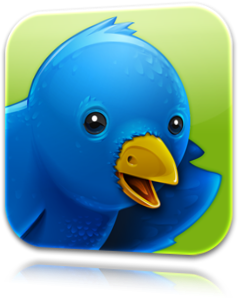 First and foremost, I had started with Twitterrific since the opening day of the App Store. But version 1.x lacked many advanced features, especially when Tweetie came on the scene. I had resisted Tweetie for quite a while, but when I started managing a second Twitter account, I ended up on Tweetie out of necessity. I switched back to the blue bird when version 2.0 came out and was instantly won back. Over time though, I did find that the new blue bird was missing a few features that Tweetie had that I really loved. Twitterrific 2.1 has taken care of all that, and is reigning supreme yet again. New “Load More…” button to retrieve older tweets in the timeline. Tap on the avatar in the author info view to view the avatar full size. Added following and followers buttons to author view. Granted, these are not drastic things that I couldn’t live without, but they round out the experience of the app. Possibly my favorite is the custom image viewer, especially for Twitpic. The old method of loading the whole Twitpic web page was time consuming and cumbersome, as you’d have to zoom to see the image every time. Now you get a wonderful fullscreen image that loads quickly. Nice. Some other new features that I am loving is the “Address Book” view (signified by a rolodex card), a YouTube videos play within the in-app browser, the built-in web browser supports landscape view, in-app email support, and the ability to translate a tweet to your native language. The “address book” is a wonderful feature. From either the timeline view or posting view, you can bring up your followers, who you’re following, and a search area to view an account and create a mention or direct message. Very nice. Utilizing the in-app YouTube viewer and in-app email in OS 3.0 is nice. An app’s experience is greatly improved when you don’t have to leave the app all the time. For iPhone 3GS owners, you getting some special attention and love, too! You can record, post, and view video from yfrog and TwitVid. The developers note that for yfrog, you need to activate the video setting on yfrog.com. Overall, Twitterrific 2.1 is a solid feature upgrade that really gives the blue bird some new pluck. Twitterrific 2.1 is available in an ad-supported free [App Store] version and a $3.99 ad-free Premium [App Store] version. P.S. ~ It’s not a bad idea to follow @Twitterrific on the Twitter. App specific news is regularly pumped out there and helpful hints and tips for the app are offered as well.